Free download Audials One Latest Version.Audials One is the best at quickly supplying you with massive amounts of free and legal music. Only Audials can monitor thousands of Internet radio stations, while simultaneously searching for the highest quality tracks to automatically give you the music you want for your PC, cloud or portable playback device. 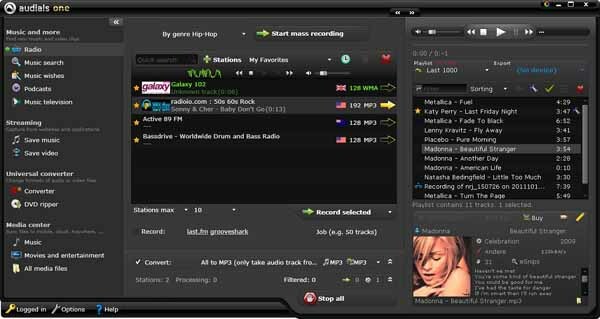 Audials One uses the entire scope of your broadband connection to supply you with targeted recordings of music tracks by 870,000 artists or MP3s en masse from 120 different genres—24/7, completely automatic, free, legal and in music-shop quality. Audials One records from radio stations, music streaming, TV, video clips and movies, before saving those files individually in the best possible quality. Audials gives you any protected and unprotected media file you can find online for you PC, smartphone or tablet. There’s no easier way to get free entertainment for at home or on the go. Miss your favorite show? Not a problem with Audials One! Audials One lets you enjoy your favorite series even after it’s aired. Wth Music TV and the World of Podcasts, there is a ton of entertainment waiting just for you. Boredom is a thing of the past! Audials One doesn’t only just deliver lots of free entertainment straight to your computer. It also polishes your new files and packs a bunch of extras to optimize your entertainment fun. With Audials you can locate radio stations quickly and easily, before enjoying your new sounds in the convenient Audials Player. Not matter how massive your music and media collections are, Audials has got you covered with management features for your PC, cloud or portable device, while the Music Universe wows visually. Audials thought of everything, so you can sit back and enjoy your tracks.